The house occupies a spectacular position high above the north Norfolk coast with views over the North Sea. A previous building on the site dating from the 1960s was demolished. The design was influenced by the client’s desire to incorporate architectural influences from Rhode Island in America. Traditional Norfolk detailing and materials were used on the elevations, but the interior of the house is entirely contemporary in design. The main house faces the sea, with a single storey wing to the east side enclosing a sheltered garden. A formal front elevation with a central projecting bay faces the drive. South elevations have iroko slatted balconies and a stone loggia opening onto the paved terraces. The east wing contains the swimming pool, with large sliding doors within a colonnade of engaged pilasters and entablature. A long hall runs along the south side of the house, connecting the main rooms and the central staircase. 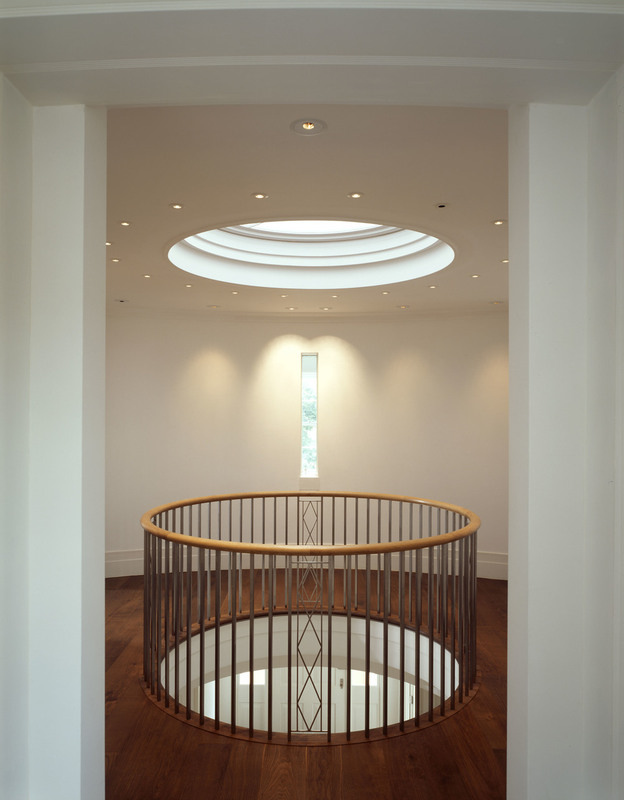 The entrance lobby opens to a circular ‘oculus’ balcony, rising to a lay-light high above. The drawing room and principle rooms face south and west to the gardens designed by Mark Walker Design. The interior detailing is restrained minimalism. The central stair in stainless steel and hardwood rises to a ‘crows nest’ cupola, filtering light through its glass floor to the hall below.